I’ve been actively using social media for nearly a decade – even longer if you count blogging. For the majority of that time, I’ve also been the public voice for a few colleges, universities and other brands. It’s fun, sure, but it also takes away some of the fun of using social media. At the end of a long day, the last thing I want to do is open Twitter and wade through the noise. The last day or so, I’ve had a chance to use social media as a regular person, not an administrator, and it was interesting, especially considering it was a crisis situation. Thanks to the polar vortex, temperatures here in Northeast Ohio dipped well below freezing, like many other areas. 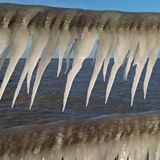 Lake Erie started to freeze, which normally isn’t a big deal. Because of the quick drop in temps, we started to get frazil ice in parts of the lake, including near where the water is brought in for many local communities. The intakes started to get full of ice, drastically reducing the amount of water being made available to several cities, including mine. I started to see some chatter on Twitter and Facebook about it, and soon after the local news outlets picked it up. Our city, Avon, used their website to offer two updates. First, in the afternoon, saying please reduce water use, and later in the evening, a vague warning saying “do not use any water.” They did not use social media or their web in an effective way, instead filtering the message through the media. It was an interesting choice, especially for something that can change so quickly as the amount of water available. It was an hour by hour and minute by minute story. Not only were they active in keeping people up to date, they were using Facebook and Twitter to respond to customer questions. They were upbeat, positive and realistic and I think it went a long way in customer’s eyes, including mine. When the power goes out, you don’t get that kind of updates from the big, faceless electricity company. You get anger and people turning to social media to vent and be negative towards your brand. Instead, when service was restored and throughout the process, people were supportive, appreciative, and hopefully come away from the experience with a more positive impression of Avon Lake. 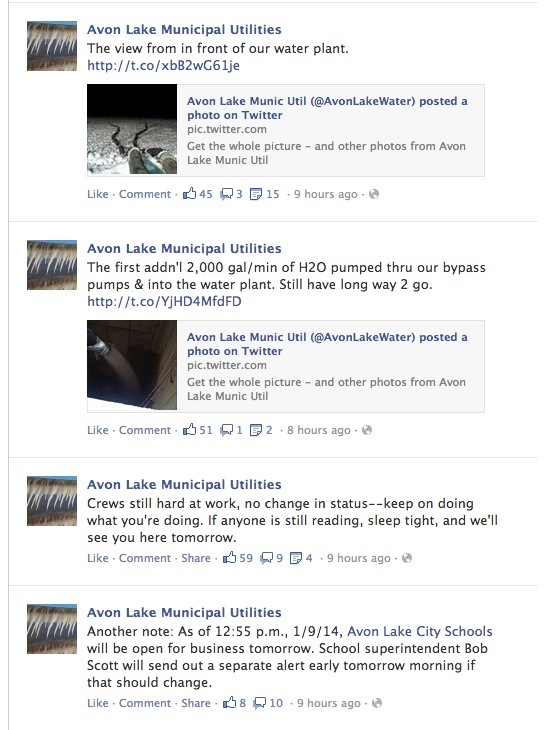 Other utilities could take a lesson from how Avon Lake handled this situation. I bet they’d love to have hundreds of comments on their Facebook pages that look like this, and this is all I could fit in one screenshot. Here’s the post in question.